EDINBURG — The city offered Cesar Torres the police chief job just one day before he submitted his employment application to the online portal used by all 38 applicants, according to records the city released late last week and documents previously obtained by The Monitor. Torres was sent a conditional offer of employment on Dec. 11, 2018, one day before the submission date of his employment application and two days before the city spokeswoman previously said the application period officially closed. City Manager Juan Guerra did not return a request for comment seeking clarification on the discrepancy between the dates of the conditional offer and the actual submission of the job application. 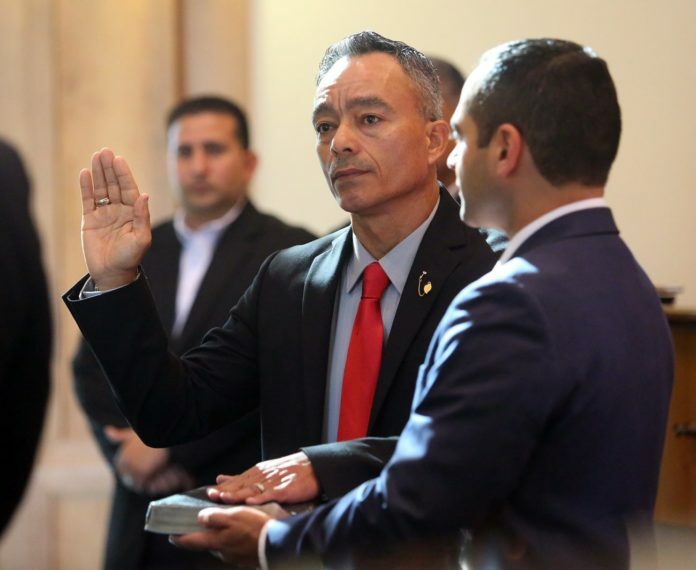 The city opened applications late last year after Guerra, who was hired in October 2018, demoted former police chief David White to the rank of lieutenant. That demotion came after Guerra determined White’s job performance to be “unsatisfactory” based on online public safety rankings. No such plan seemed to be in place following White’s demotion. Two interim chiefs were named to the position prior to Torres’ hiring, one of whom — Lt. Edgardo “Edgar” Ruiz — stepped down after only a month on the job citing personal reasons. The city manager selected Torres, who worked for the Texas Department of Public Safety for more than two decades, out of a pool of applicants that included current and retired police chiefs from Texas cities as well as those from departments across the country — New York state, Missouri, Illinois, Arizona, New Mexico and South Dakota. Of the 38 applicants, only three submitted applications later than Torres’ Dec. 12, 2018 submission — all doing so on Dec. 13, 2018. The majority of applicants listed the job site Indeed as to where they learned of the position. Applicants from the Rio Grande Valley included Alvaro Garcia, the Palm Valley police chief who was arraigned on multiple counts of tampering with government records earlier this month; Michael Kester, the assistant chief of police in Harlingen, who was named interim chief of police in late December; Ellwood “Tom” Whitten Jr., a former Harlingen police chief who left that department in 2013 to work as chief deputy for the El Paso County Sheriff’s Office; and Miguel Yerena, an assistant police chief in Pharr. A lieutenant from Palmhurst, as well as one from McAllen applied, as did a retired Hidalgo County Sheriff’s Office sergeant. Torres’ hiring has not been without controversy. He was demoted at DPS from the rank of lieutenant to sergeant in May 2018 after an internal investigation determined he abused the agency’s recruitment bonus program for financial gain, The Monitor reported last month. The city manager, however, said last month the agency’s internal investigation “did not factor in (his) interest to hire Torres” to lead the city in improving its public safety rating.